Written by Dr Evert Semeijn on 5th June 2018 . 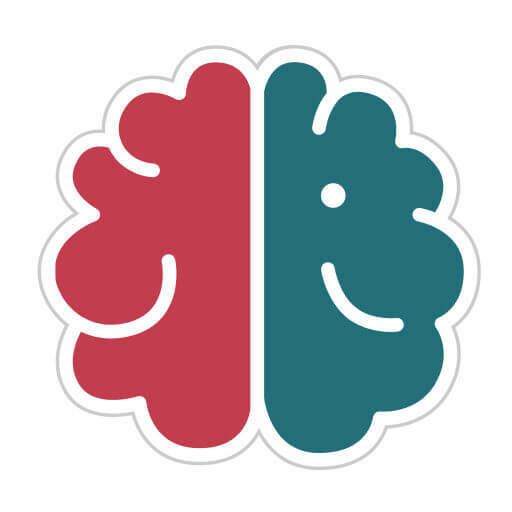 We’ve selected 20 books about neuromarketing that we believe should be on your bookshelf. 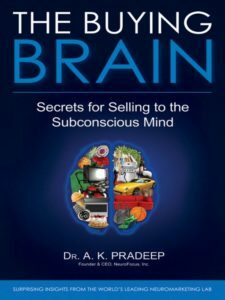 Some of them give you a broad overview of neuromarketing and others deep-dive into the conscious and subconscious brain. 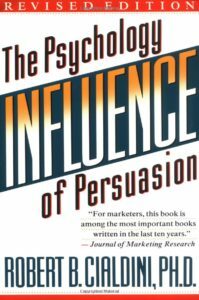 In his book ‘Influence: The Psychology of Persuasion’ (1984) Cialdini explains in detail the fundamental principles of persuasion that get us to say yes. Including how they are used against us by compliance professionals like salespeople, advertisers and con artists. Knowing these principles will allow you both to become a skilled persuader yourself and to defend yourself against manipulation attempts. ‘Pre-Suasion’ (2016) is about the art of influencing. In particular, it reveals that influence is about more than the specific wording of a pitch; it’s about how the pre-suader plays on our emotions, making his product or agenda seem more critical than it is. 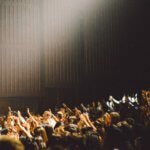 A pre-suader – be it your mom or your teacher, an advertiser or a sales agent, the media or even cult recruiters – know how to set the stage and get the desired result. Hooked (2014) explains, through anecdotes and scientific studies, how and why we integrate certain products into our daily routines, and why such products are the Holy Grail for any consumer-oriented company. 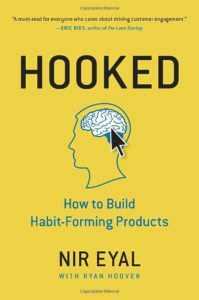 Hooked gives concrete advice on how companies can make their products habit-forming, while simultaneously exploring the moral issues that entail. 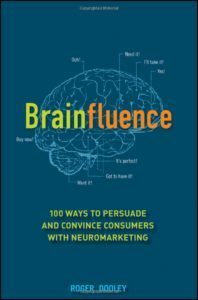 Brainfluence (2012) explores the unconscious thoughts and motivations that influence our decision-making process and offers tips and tricks on how savvy marketers can exploit them. By understanding the mechanisms that cause us to buy (or not buy), you can increase your sales while keeping your customers happier. 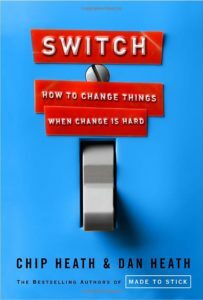 Switch examines why it is often difficult for people to switch their behaviour, and how, by understanding the mind, it is possible to find shortcuts that make change easier. Through scientific studies and anecdotes, Switch provides simple yet effective tools for implementing changes. 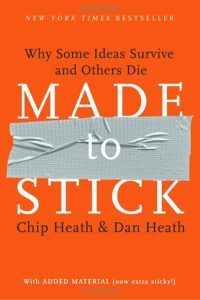 The book lays out essential characteristics of “stickiness”; that is, what makes ideas “stick” in the mind, and how to make them work for you. 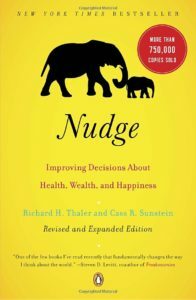 The message of Nudge is to show us how we can be encouraged, with just a slight push or two, to make better decisions. The book starts by explaining the reasons for the wrong choices we make in everyday life. 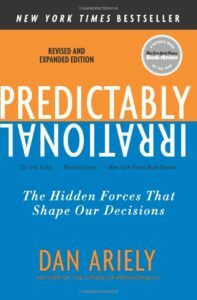 Predictably Irrational (2010) explains the fundamentally irrational ways we behave every day. Why do we decide to diet and then give it up as soon as we see a tasty dessert? If you tried to pay your mother for a Sunday meal she lovingly prepared would she be offended? What’s the reason pain medication is more effective when the patient thinks it is more expensive? The reasons and remedies for these and other irrationalities are explored and explained with studies and anecdotes. 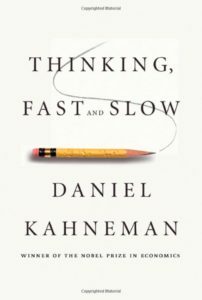 Daniel Kahneman’s Thinking, Fast and Slow (2011) – a recapitulation of the decades of research that led to his winning the Nobel Prize – explains his contributions to our current understanding of psychology and behavioural economics. Over the years, Kahneman and his colleagues, whose work the book discusses at length, have significantly contributed to a new understanding of the human mind. We now have a better understanding of how decisions are made, why specific judgment errors are so prevalent and how we can improve ourselves. 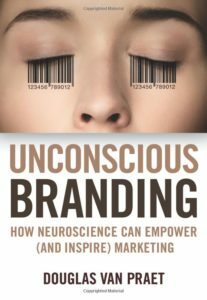 Unconscious Branding (2012) reveals how marketers can tap into our subconscious, encouraging our participation in and support of company brands. In just seven steps, you’ll discover new strategies to guide your own company toward developing a brand with which customers can build a genuine relationship. Day in and day out we’re bombarded by thousands of brand images, logos and commercials enticing us to buy their products. However, only some ads motivate us to whip out our wallets. Why? Using cutting-edge neuromarketing methods, Buyology answers that question and explores the hidden motivations behind our purchasing decisions. 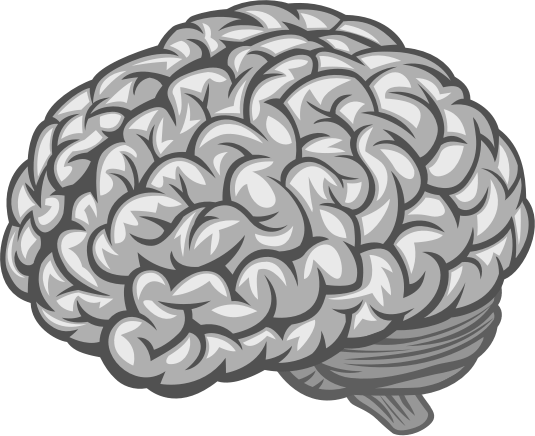 Neuromarketing is a controversial new field where researchers study consumers’ brain responses to advertising and media. It provides new ways to look at the age-old question: why do consumers buy? This book goes beyond the hype to explain the latest findings in this growing and often misunderstood field and shows business owners and marketers how neuromarketing works and how they can use it to their advantage. You’ll get a firm grasp on neuromarketing theory and how it is impacting research in advertising, in-store and online shopping, product and package design, and much more. 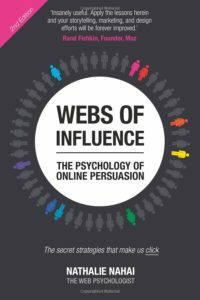 In this book The Web Psychologist, Nathalie Nahai, expertly draws from the worlds of psychology, neuroscience and behavioural economics to bring you the latest developments, cutting-edge techniques and fascinating insights that will lead to online success. Webs of Influence delivers the tools you need to develop a compelling, influential and profitable online strategy which will catapult your business to the next level – with dazzling results. Remember that voice in your ear when you make the most critical decisions in your lives—but you’re never aware of? That’s the hidden brain. It decides whom we fall in love with and whom we hate, tells us to vote for the white candidate and convict the dark-skinned defendant, to hire the thin woman but pay her less than the man doing the same job. Our brain can direct us to safety when disaster strikes and move us to extraordinary acts of altruism. But it can also be manipulated to turn an ordinary person into a suicide terrorist or a group of bystanders into a mob. In a series of compulsively readable narratives, Shankar Vedantam journeys through the latest discoveries in neuroscience, psychology, and behavioural science to uncover the darkest corner of our minds and its decisive impact on the choices we make as individuals and as a society. 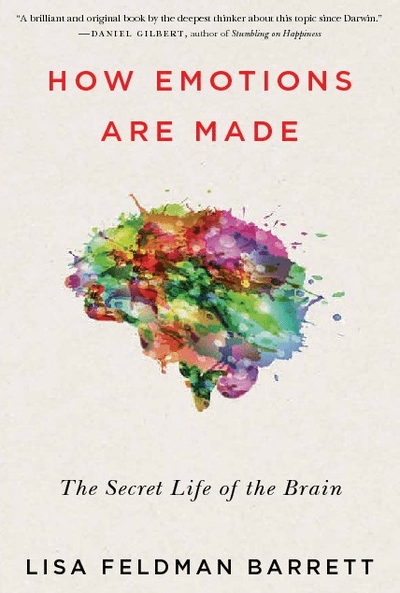 Filled with fascinating characters, dramatic storytelling, and cutting-edge science, this is a gripping exploration of the secrets our brains keep from us—and how they are revealed. 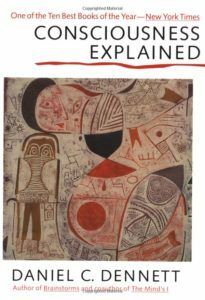 Consciousness Explained is a full-scale exploration of human consciousness. 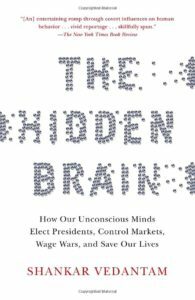 In this landmark book, Daniel Dennett refutes the traditional, commonsense theory of consciousness and presents a new model, based on a wealth of information from the fields of neuroscience, psychology, and artificial intelligence. Our current theories about conscious life-of people, animal, even robots–are transformed by the new perspectives found in this book. 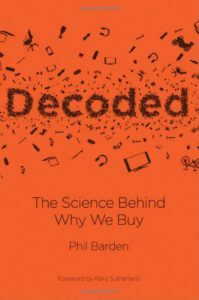 In this groundbreaking book, Phil Barden reveals what decision science explains about people’s purchase behaviour, and demonstrates its value to marketing explicitly. He shares the latest research on the motivations behind consumers’ choices and what happens in the human brain as buyers make their decisions. Phil deciphers the ‘secret codes’ of products, services and brands to explain why people buy them. And finally, he shows how to apply this knowledge in day to day marketing to significant effect by dramatically improving key factors such as relevance, differentiation and credibility. Today, businesses of all sizes generate a great deal of creative graphic media and content, including websites, presentations, videos and social media posts. Most big companies, including Procter & Gamble, Coca-Cola, Tesco and Google, now use neuroscience research and theories to optimise their digital content. 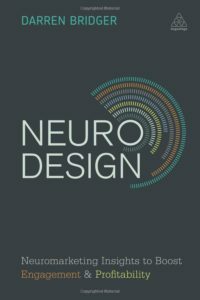 Neuro Design opens up this new world of neuromarketing design theories and recommendations and describes insights from the growing field of neuroaesthetics that will enable readers to enhance customer engagement with their website and boost profitability. Online resources include web links to inspiring reading and further website resources. The subconscious mind makes as much as 95% of our decisions. 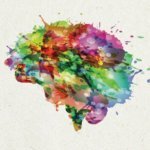 As a result, the world’s largest and most sophisticated companies are applying for the latest advances in neuroscience to create brands, products, package designs, marketing campaigns, store environments, and much more, that are designed to appeal directly and powerfully to our brains. The Buying Brain offers an in-depth exploration of how cutting-edge neuroscience is having an impact on how we make, buy, sell, and enjoy everything, and also probes more profound questions on how this new knowledge can enhance customers’ lives. Although I agree with most of your choices, I have an issue with 3 of those books. 1 Pre-suasion. Although I’m a total fan of Cialdini this book contains very little new concepts. In fact almost 50% of the book is just old references! It really feels like the book was published for nothing more than selling a few copies based on the fame of the author! 2 Biology and 3 The buying brain. Those don’t bring much especially when you compare them to Think Fast and Slow or Predictably Irrational or Nudge. By the way have you read: Before you know it?… I think it might make it to your top list. 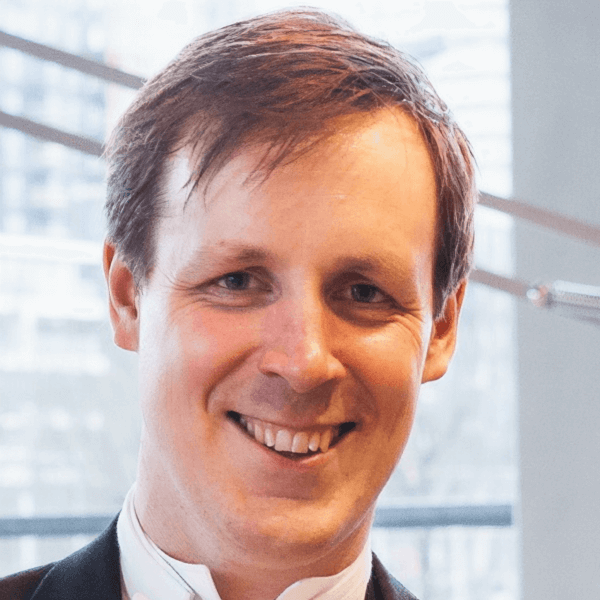 I am the co-author of NeuroMarketing which you have kindly listed and we are now releasing our second book titled “The Persuasion Code” (available mid september on Amazon). You might also like it but here I might be a little biased!!! 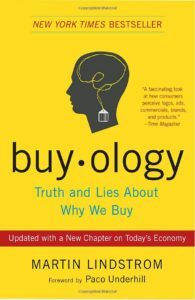 Buyology and the Buying Brain are indeed not for experts. It does –however– give some good insights for those completely new to the field. 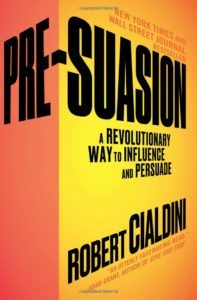 As for Pre-suasion: although most of the content is recycled, it is packaged in such a way that attentive readers get to see the ‘priming matrix’. 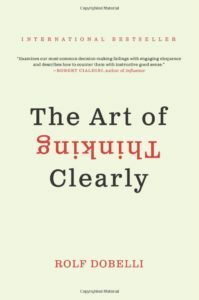 We believe this is actually one of the better books to get a basic understanding of how we’re subconsciously influenced. We’ll definitely check out ‘Before you know it’. And feel free to send us a copy of your new book if you want us to review it on our website! Many thanks for including my book ‘Decoded’ in your list. Regarding Buyology, thanks for bringing this to our attention. We strongly support your statement, urge readers to read the mentioned article, and would like to add some context. The value of Buyology is -in our eyes- not in the soundness of the scientific research. 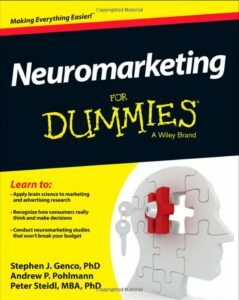 Instead, novice readers grow an understanding of what the potential of neuromarketing is. 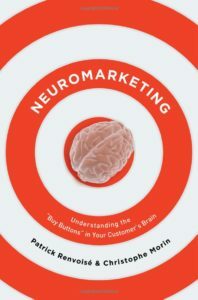 Also, although sometimes oversimplified, Martin did a great job of creating awareness for the neuromarketing industry. That’s why it’s on this list.